We invite you to take your time and thoroughly search this site for all of the information it has to offer to you. There are approximately 50 pages of information on this site ( and still growing ) and links to other sites as well. We are a small business that installs, services, and maintains aquariums in offices, schools, waiting rooms, hospitals as well as in private homes. We also install and service garden ponds. We also admit that we do not know everything there is to know about aquariums and their inhabitants, in fact no one does. As our understanding of science improves, and technology advances, we are always updating our views and ideas about the world around us, and so we have placed links to other web sites from which you may also glean information as well as links to on-line aquarium supplies and breeders of fish. Please remember that some of these websites may be a little outdated, and as such carry some old information on them, so sift through their pages with caution and think carefully and logically about what you read before you put any of their ideas into practice. This is indeed a learning experience for everyone involved, novice and expert alike. Also, just because we have a link to a commercial site does not mean that we endorse all or any of the products they sell, nor can we vouch for their customer service or commercial practices. David, the owner of this business, ( Tropical Newfoundland ) has over thirty years of experience with keeping and breeding Tropical Aquarium Fish, and propagating aquatic plants. He is willing to answer any questions that you may have regarding fish, plants or this site. Just drop him an e-mail from any one of the places in this web site that gives you the e-mail address, he will reply as soon as he is able to ( usually within 24 hours ). If you live on the Avalon Peninsula of Newfoundland and want some help getting your aquarium into good condition, or want us to set up a regular maintenance routine, again just drop us an e-mail and let us know, we will do our best to accommodate the request. 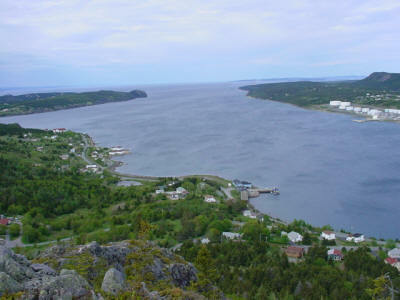 All of the above photos were taken around the Avalon Peninsula by David, the owner of this site and business. In the background you can hear ( if you have your speakers turned on ) a toe tapping and lighthearted mix of two well known Newfoundland tunes: "There's lots of Fish..." and "I'se the By" . There are other places in these pages that follow where music can be heard, so keep those speakers turned on !